To read the full reviews, check out HAMMOND’s Goodreads page. 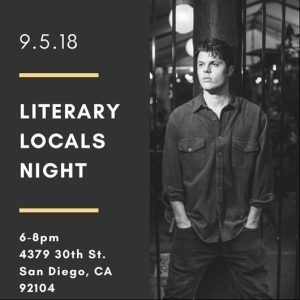 The Secret Stash will be hosting Jonathan LaPoma for Literary Locals Night on Wednesday, September 5th, from 6:00-8:00pm. The event will be held at 4379 30th Street, San Diego, CA 92104. Danica Jambalos included Jonathan LaPoma’s coming-of-age novel DEVELOPING MINDS: AN AMERICAN GHOST STORY in her “12 Sidesplittingly Hilarious Novels For All Readers” Wiki.ezvid video. Jonathan LaPoma’s feature-length black comedy DIPLOMATIC AMMUNITY! is a finalist in the 2018 Oaxaca Film Festival (comedy category). This is the script’s 12th award/honor and LaPoma’s 156th overall. Jonathan LaPoma finished the first draft of his latest novel, HAMMOND, which follows a group of troubled boys who play basketball at a city court in Buffalo as a means to escape their abusive households. LaPoma hopes to publish the book by Christmas. Jonathan LaPoma’s psychological coming-of-age novel THE SUMMER OF CRUD is a finalist in the 2018 Eric Hoffer Book Award, which “honors the memory of the great American philosopher Eric Hoffer by highlighting salient writing.” The novel was recently the #1 Psychological book on Kobo, and has been at the top of the Literary list as well for the last week. Jonathan LaPoma’s coming-of-age literary novel THE SUMMER OF CRUD is the #1 “Psychological” and #2 “Literary” novel on Kobo.